The following is the 2019 schedule for the Arizona Rattlers. Entering their third IFL season, the Rattlers will try and to get back to the United Bowl, which they won in 2017, their first IFL season. Arizona finished 11-3 last season and made it to the Intense Conference Championship game before being defeated by the Sioux Falls Storm. 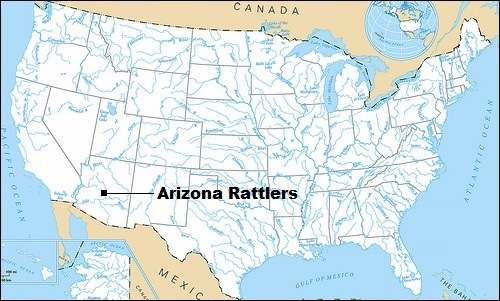 Prior to their entry into the IFL, the Rattlers spent 24 years as members of the Arena Football League. over that time, they won five ArenaBowls, including three straight from 2012 to 2014. They reached the playoffs in 21 of those 24 seasons, including their last eight seasons in the AFL. Arizona begins its 2019 campaign with a trip to Wisconsin to face the Green Bay Blizzard. The Rattlers then has a four-game home stand, mixed in with its first two bye weeks. They have two three-game road trips, prior to closing out the season at home against the league's two expansion teams, the Tucson Sugar Skulls and the San Diego Strike Force. They play those teams four times each. The Rattlers do not face the defending champion Iowa Barnstormers, the Bismarck Bucks nor the Quad City Steamwheelers this season. Each IFL team plays 14 games (seven home and seven away), and has three bye weeks. The Rattlers byes come in weeks 3, 5, and 12. They play their home games at Talking Stick Resort Arena in Phoenix, Arizona. Kevin Guy is the Rattlers' head coach. All Rattlers games will be broadcast locally on the radio and will be available for streaming through those stations. SCtoC will provide links in its previews of the games, as well as recaps of each IFL game. All IFL games are available to be streamed on video via the IFL's YouTube channel. Below is the Rattlers' 2019 schedule. Home games are noted in bold teal. Times and dates are subject to change. All times are pacific. Click on the final score for the boxscore and Recap for SCtoC's original recap of this game. Week 9 -- Mon., April 22 - at San Diego Strike Force, 6:05 p.m.
Week 10 -- Sat., April 27 - at Sioux Falls Storm, 6:05 p.m.
Week 11 -- Sat., May 4 - Nebraska Danger, 5:05 p.m.
Week 13 -- Sun. May 19 - at San Diego Strike Force, 5:05 p.m.
Week 14 -- Mon., May 27 - at Tucson Sugar Skulls, 6 p.m.
Week 15 -- Sat., June 1 - at Cedar Rapids River Kings, 6:05 p.m.
Week 16 -- Sat., June 8 - Tucson Sugar Skulls, 5 p.m.
Week 17 -- Sat., June 15 - San Diego Strike Force, 5:05 p.m.